Preface This new edition of this book " Production Technology" has been thoroughly revised, enlarged and brought up-to-date to cover the complete latest syllabus of most of the Engineering Colleges, Technical University across India, Engineering Services Examination conducted by U.P.S.C. and GATE exams conducted by IITs, and also to cater to the needs of Production Engineers engaged in factories, workshops and design offices. The purpose of this textbook is to provide a comprehensive knowledge and insight into various aspects of engineering materials, their heat treatment and fabrication, casting and foundry practices, hot and cold working of metals, welding and other joining techniques, manufacturing processes, machining and tooling techniques, non conventional methods of machining, cutting tools, tooling equipment and machine tools, dies, jigs and fixtures, presses, etc. As computers are finding more and more usage in factories, special attention has been given for their full coverage. Separate chapters have been devoted to Flexible Manufacturing System, Numerical Control of Machine Tools, Machining Centres, CNC and DNC Machine, Robots and Robotics; Automated Factories, etc. to cover the advanced topics of Manufacturing Technology. 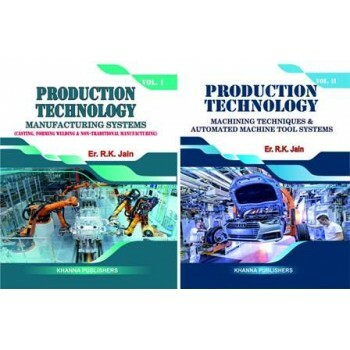 Chapter on Emerging Trends in Production Technology has been enlarged to cover most of recent developments in the field. As trend is towards objective type questions, lot of such questions have been added in each chapter. The intention of writing this book is to achieve the above objective and make the students feel at home in accepting the challenges posed on them. A good number of important problems collected from several universities have been solved and given at the end of each chapter. Table of Contents * Engineering Materials * Heat Treatment * Plastics *Power Metallurgy * Surface Finishing, Coating and Modification Techniques * Casting * Welding, Soldering and Brazing * Hot-Working Processes *Cold Working of Metals * Power Presses and Power Press Operations * Unconventional Methods of Machining * Manufacture of Modern Electronics Components * Industrial Safety * Fundamentals of Machine Tools * Lathe * Sharper and Slotter * Planer * Installation, Operation and Maintenance of Machine Tools ( Centre Lathe) * Milling Machine * Broaching and Sawing * Drilling, Boring and Jig Boring Machines * Grinding * Theory of Metal Cutting * Cutting-tool Materials * Machinability * Dynamometry * Cutting Fluids * Cemented Carbide Tools * Jigs and Fixtures * Threads and Thread Cutting * Gear Manufacturing * Turret and Capstan Lathes * Hydraulic and Electrical Transmission of Machines * Automatic Machines *Automating Assembly * Numerical Control Machine Tools * CNC/DNC Machine Tools, Machining Centres and Special Tools * CAD/CAM * Robots and Robotics * Flexible Manufacturing Systems (FMS) * Computer Integrated Manufacturing Systems (CIMS) * Agile Manufacturing * Emerging Trends in Production Technology.